There are lots of landscapes which have a unique red bed with steeps cliffs located in the northwest, southwest, and southeast China. These areas are known as the Danxia landform. These are areas in China with peculiar relief features. Places like the Purnululu National Park in Australia, Bryce Canyon, Red Rock Canyon, and Zion in America also have similar rock formations. In some sandstone areas in China, there are parklands with ancient Buddhist caves, rivers, waterfalls, and green foliage while others may have lots of different colors. There is no clear origin of the term “Danxia (丹霞)”, but it is simply a reference to the glow which is cast on the clouds during sunset or before sunrise. The oldest use of the word was in a poem written by Cao Pi. He is popular in the Three Kingdoms era for establishing the Cao Wei State. 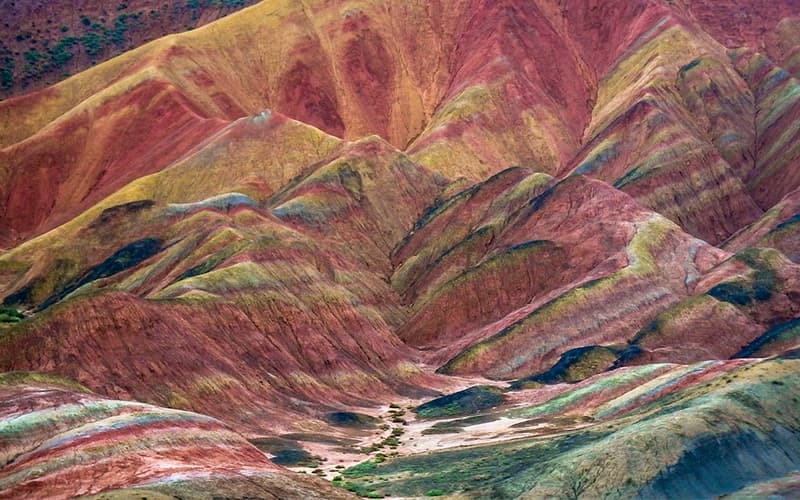 In China, Danxia is quite a common name for various hills and mountains. of all these hills and mountains, the most significant is located in the Renhua County, Shaoguan, Guangdong Province, south China. 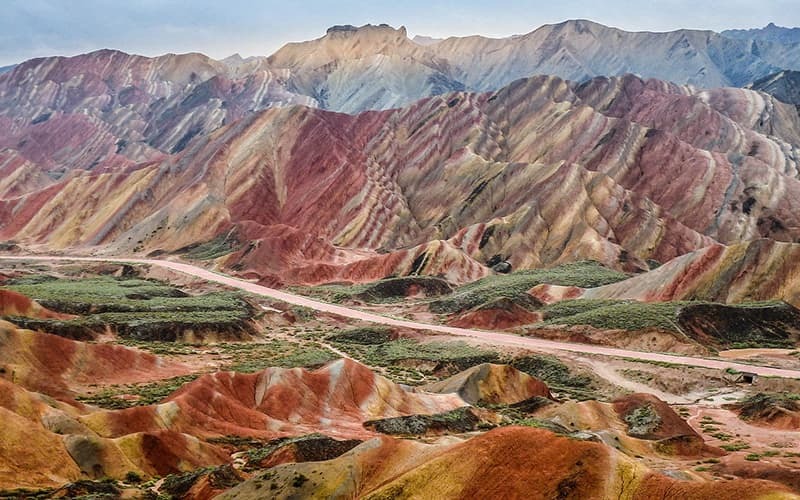 The main reason why it is the most significant is that the first time reddish sandstone was described using the “Danxia,” it was in this location. The discovery of the reddish sandstone was in 1928 by Dr. Feng Jinglan, a geologist, while a decade later, Dr. Chen Guoda, a colleague, promoted the Danxia Landform concept. In southern China, UNESCO declared six park areas as World Heritage in recognition of the unique traits of the Danxia rock formations – a peculiar geology and aesthetics. The locations include Taining and Mount Guanzhi of the Fujian Province, Mount Chishui in the Guizhou Province, Mount Langshan and Mount Wanfo in the Hunan Province, Fangyan and Mount Jianglang of Zhejiang Province, Mount Longhu and Guifeng of Jiangxi Province, Mount Danxia of Guangdong Province. The Danxia landscapes are great spots for people to go hiking, sightseeing, and for recreation while the landscapes go from a terrain which is green and watery, to rock formations which are desert-like. Of the various Danxia parklands available, here are the top six. The bright color is the notable feature of Zhangye. In China, the sandstone is the most colorful and this may also be the same worldwide. Although the colors are not as much, there are red pinnacles and cliffs in Binggou. It has a lot of similarities to the Red Rock Canyon in the United States. The rock formations are very visible since it is more like a desert region. When it is close to sunset, there are significant changes in colors making this the best time to visit. The Red Wave of China is similar to "the Wave of Arizona." It occurs at around 450 km away from Xi'an in the northern direction. Just like the Chinese flag, the Chinese Wave is largely red in color. If you hope to visit this location, you should be ready for a long journey. This is because the infrastructure and facilities are not developed for tourism. Regardless, it is quite a sight with unique swirls of the sandstone. There are lots of attractive sights at Taining including caves and a hanging Buddhist temple. You can also find plants which cover the eroded spires and cliffs. The boat cruise is also a great way to view the scenery of this park which is close to Xiamen, from another perspective. Another popular destination is Mt. Wuyi which offers streams and waterfalls where tourists can go hiking and rafting. The journey to this location is just 2 hours 30 minutes from Taining. The reservoir lake and the sharp cliffs are some of the notable features of Kanbula in the Qinghai Province. With a height of over 6,600 feet, the altitude of this mountain is much higher than those in other parks. There is a boat trip to enjoy a view of the location but the color of the rocks do not compare to that of Zhangye. Mount Wanfo and Langshan are a part of the World Heritage listing. Similar to Zhangjiajie/Wulingyuan in Hunan, you will also find peaks which are sharp and high on Mount Langshan. In contrast to Danxia sandstone, a much stronger stone known as quartzite is present in Wulingyuan. In place of spires, you will find lots of mesas in Wanfo. Foreign tourists don't visit these two areas very often. The Danxia landscapes all derive their name from the Mount Danxia. The formations of sandstone rocks, mesas, and pillars make it a popular hiking location. River boating is another activity which is available. Tourists don't usually troop into this location. This makes it a perfect option for anyone looking to avoid the Guangzhou city and its crowds. There are Chinese hotels close by for anyone who chooses this place for hiking or simply to enjoy nature. The sandstone of the Bajiaozhai Geology Park is whitish-red in color with top layer vegetation. The sandstone is quite similar to the karst hills limestone around the Guilin area. This is one of the few areas which doesn't attract lots of visitors. From Guilin, it is just 107 kilometers or 66 miles so if you are visiting Guilin, you can also plan for a visit to this location.